← Is the ALP doomed to lose in 2013? It may already be too late to head off a European recession — the ECB’s latest bank lending survey shows that European banks are finding access to credit more difficult (their vast holdings of peripheral sovereign debt have undermined their credit-worthyness), and that they are passing that unpleasentness onto households and firms in the form of tighter credit. You can see from the above question about market access, that basically every form of wholesale funding has become more difficult – and that this is expected to become more of a problem in due course. 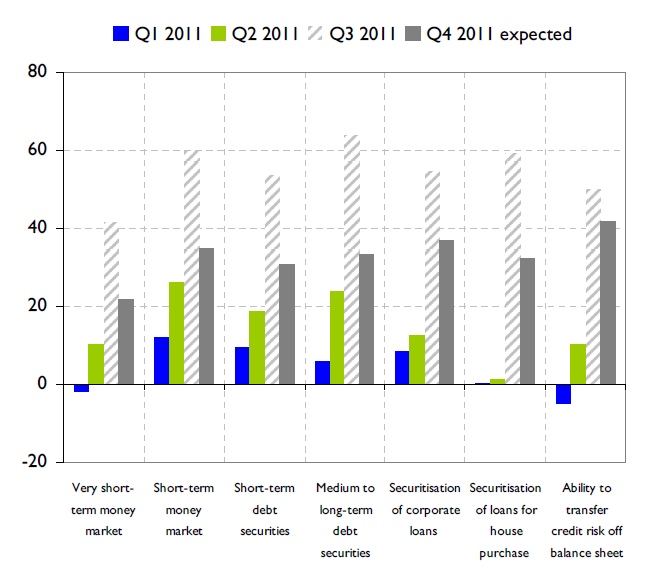 However, this is not the only reason that Banks are tightening lending standards. 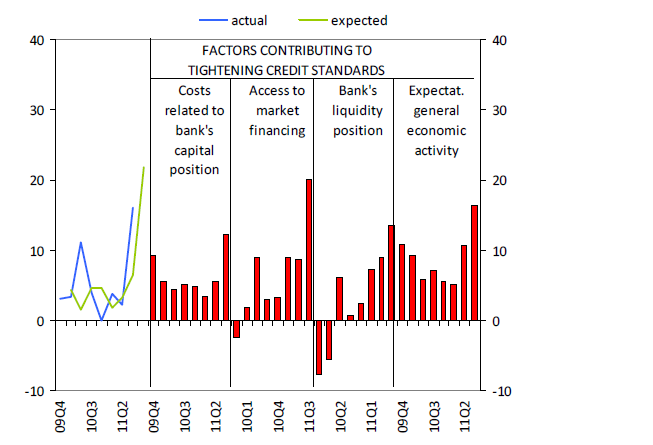 You can see in the above chart, that banks are also tightening lending standards to firms as they have become more pessimistic about the economic outlook. 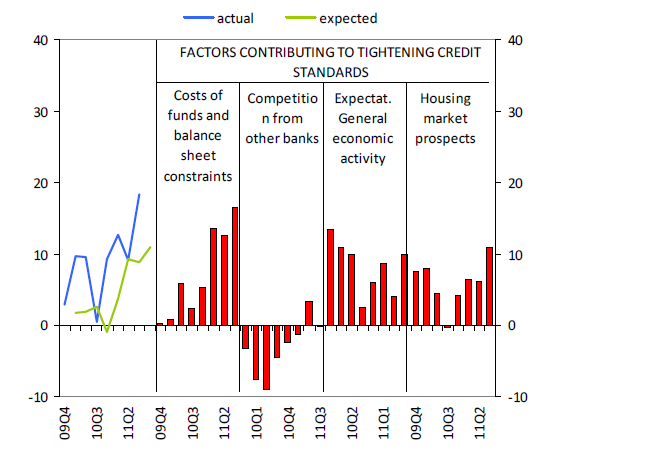 Similarly, banks are tightening credit for home-lending, both for ‘financial’ reasons, and because they are more pessimistic about the economic and housing market outlooks. 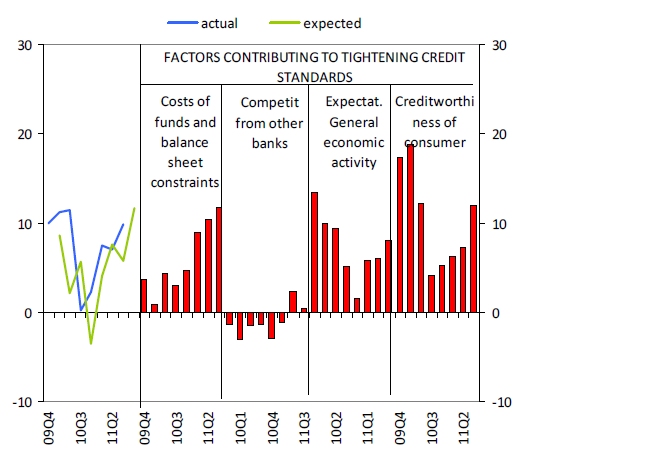 Finally, the pattern repeats with personal (non-housing) loans — financial factors are a problem, however there has been an increase in concern about the creditworthiness of consumers. My guess is that a credit crunch is underway. European banks need capital, and they need it fast, else the resultant recession is going to mean that Greece is not the only one with an urgent solvency problem. Helpfully, the IMF shocked their baseline growth scenario by 1% in their September fiscal monitor so we have an idea of the consequences. Against the IMF baseline, Spainish debt to GDP rises 13.5ppts to 91% of GDP by 2016; Ireland +14.5ppts to 129%; Portugal +16.5ppts to 127%; and Italy +18ppts to 132%. 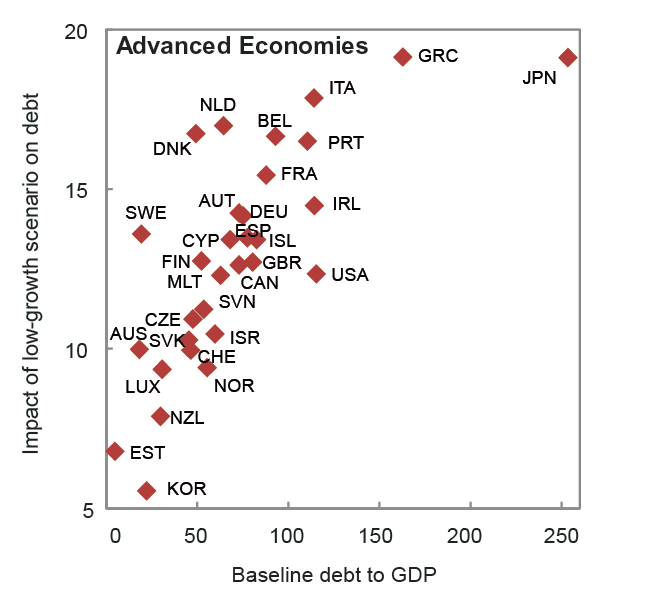 Worryingly, there is little scope for the major nations to help either their fellow sovereigns or their banking sectors: a 1% growth shock causes US debt to GDP to rise +12.3ppts to 128%; German debt to GDP to rise 14.2ppts to 89%; and French debt to GDP to rise 15.4ppts to 103.2%. And that’s not couting the ~1.5tn in Government Guaranteed bank bonds that have still to mature. Happily, Australia is a more healthy +10ppts to 18.2% of GDP; and NZ is +7.9ppts to 37.6% (and both the RBA and RBNZ can still cut their policy rates). 1. Nice: you got your own domain name. Ha, you got me there. By the end of the next recession, i may be agreeing everything the man says!